For Walter Benjamin, a German Jewish literary critic and philosopher writing in 1940, the very notion of “historical progress” was a cruel illusion. Benjamin, age forty-eight at the time, had already lived through World War I and its aftermath. Now, in the second year of yet another war, the course of history had been commandeered by Fascism, a “catastrophe that keeps piling ruin upon ruin.” Benjamin was himself destined, several months after he wrote these words, to become one more lifeless body tossed upon the heap. In 1940, seized by authorities in Spain during his effort to escape across the Pyrenees from France, he committed suicide. But Benjamin probably did not take his own life simply because he feared being turned over to the Nazis: he had described himself as melancholic by nature, and had considered suicide earlier in his life. In Germany in the years between the two world wars, despair affected many of Benjamin’s contemporaries too. Among them were my mother and her brother Ralph Zucker, a Jewish student of medicine in Leipzig in the 1920s. My mother and uncle were born in the first decade of this century into an upper middle-class, assimilated Jewish family in Dresden. My grandfather was a successful chemist who fought in the army for the Kaiser and returned home decorated with medals. The family was affluent, and the children well provided for materially. Yet my Uncle Ralph became desperately unhappy and killed himself in 1927. “Melancholy” is no longer the most common way of referring to the condition of those who view life as no longer worth living. The favored term today is “depression,” considered to be a physiological condition for which a standard remedy has become a pill designed to elevate neurotransmitter activity within the confines of the brain. To be sure, biological factors may be implicated in chronic unhappiness. Depression may beset not only individuals, but sometimes entire families, thanks perhaps to a shared genetic inheritance. But DNA is not the only way in which our lives are interwoven, for despondency and despair correlate with what goes on in the social world. When the rate of unemployment rises even a fraction of a point, the suicide rate is apt to turn upward as well. Historical circumstances can shape our lives as powerfully as the material bodies through which we live. I am thinking now of my own parents and of my Uncle Ralph, whose desperate act took place long ago in a city far removed from California, my home. In subtle ways, and along pathways that we might not have suspected, sorrow may be conveyed from one generation to the next. In 1940, a month before Benjamin took his own life in the Old World, I was born into the New one. My father and mother were of the same generation as Benjamin but had emigrated to the United States in 1938. Like so many European Jews who narrowly escaped the Holocaust, they deliberately wanted to put their past behind them. What had happened in Europe was never mentioned in our household. For my father especially, the past was a closed book. When I was born, my mother wanted to name me “Ralph,” in memory of her lost brother. My father objected, and “Ray” was chosen as a compromise. As a child, I can remember my mother Hilda sitting in the kitchen, crying as she prepared dinner. I could make no sense of this sadness at the time. Now, half a century later, I have a clearer idea. In addition to the other causes of her unhappiness, she was most likely recalling her brother and others left behind in Europe. My parents were hoping that, securely deposited in the New World, I would be spared their grief. Only partly has it worked out as they expected. Memories – of what happened within my parents’ generation but also to others whom I have lost along the way – have a way of overflowing the walls built to contain them. Of course, such memories and the emotions they evoke can be responded to in any number of ways. Melancholy may strangle one’s interest in the world and one’s willingness even to get out of bed in the morning. On the other hand, it can also incite rebellion against an intolerable social order and unravel the self in ways that are creative and liberating. Benjamin exemplifies this paradox: the heightened receptivity to experience that enabled him to write with such originality and brilliance about the world also made it difficult for him to live in it. Like so many of his generation, Benjamin experienced the First World War – the bloodiest conflagration in human history up to that time – as pointless and horrible carnage. But the revolutionary upheaval that occurred in its wake, in Germany, Russia, and elsewhere in Eastern Europe, seemed to represent a turning toward social emancipation as powerful and promising as any that had ever been experienced in the past. Europe’s revolutionary movements at this time represented perhaps the best chance human beings had during the 20th century of forestalling the conquest of the world by capitalism. If the workers and soldiers councils that briefly held power – not only in Russia but in Germany as well – had been able to survive the repression unleashed against them, they might have inaugurated a new, liberating path in human history. Demonstration in front of the House of Representatives in Berlin. The picket sign at the left reads: "All Power to the Workers' and Soldiers' Councils." Rosa Luxemburg speaks at the Socialist Congress of 1907. She spent most of World War I in prison. She was released on November 9, 1918. Two months later, on January 15, 1919, she was murdered. In Germany what occurred instead – thanks to the vindictive Versailles Treaty and corrupt political deals, an economic crisis, and ruthless attacks against the working class – was the decisive defeat of the Left by the end of 1923. Contributing to this defeat, according to the psychoanalyst Wilhelm Reich, was also the Left’s ignorance of the “mass psychology” of political movements. During these years, Benjamin saw the ideals of socialism violently displaced by a militaristic, eventually fascist regime. From the threshold of liberation, the Left fell into a quagmire of impotence and despair. In Germany following the War, there occurred a kind of social disintegration. Artists like George Grosz and Otto Dix satirized an urban existence that seemed to consist of a jumble of separate paths pursued by isolated, self-interested individuals. This was the situation of the “Lost Generation” in Germany in the 1920s, disillusioned not only with the traditional creeds of nationalism and religion, but also with collective affiliations of every kind. Several of Benjamin’s close friends had taken their own lives, as had his Aunt Friederike, who was like a second mother to Benjamin, intervening in his disputes with his father and introducing him to the mysteries of art, literature, and science. Benjamin was deeply shaken by these deaths. For many young people, Germany in the 1920s signified everything that had gone wrong with their lives, and they wanted, if possible, to leave the country that had dashed their hopes and ideals. Emigration was less drastic than suicide. Some German Jews, drawn to what seemed to be the only remaining progressive movement with any hope of succeeding – Zionism – went to Palestine. Benjamin’s friend Gershom Scholem made this choice in 1922. Others among his contemporaries crossed the ocean to America. Benjamin himself was not willing to abandon Europe, although in 1933 he fled to France, where he lived to the end of his life. 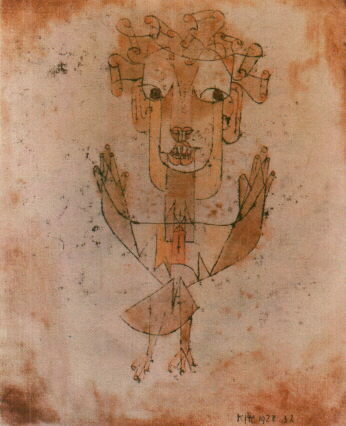 Benjamin purchased Paul Klee’s drawing of the Angel of History in 1921 for the equivalent of about thirty dollars. It remained his most prized possession until he fled to Spain in 1940. Benjamin’s interpretation of the drawing is only weakly supported by its explicit content: we do not directly perceive in it any sign of a “pile of debris” that “grows skyward” or of a storm “blowing from Paradise.” Nor is there any visible evidence of the redemptive impulse described by Benjamin: “The angel would like to stay, awaken the dead, and make whole what has been smashed.” We may notice, however, a certain tension that animates the image: the eyes of the angel point toward the right, while the rest of the body twists slightly leftward, suggesting arrested movement, possibly a conflict between past and future. The staring, astonished quality of the face, with the mouth open, is also in keeping with Benjamin’s representation. He describes the angel’s view of the historical past as compressed: “Where we [humans] perceive a chain of events, he sees one single catastrophe that keeps piling wreckage on wreckage and hurls it in front of his feet.” To the angel there is available no gradual distancing from suffering that would allow its enormity to diminish. The horror is such that neither words nor images can ever represent it adequately. The intensity of Benjamin’s description here suggests that he experienced the condition from which the Angel of History cannot escape as a personal as well as a political impasse. Although he did not go to prison or suffer any other severe repression on account of his beliefs or activities, his outlook on life is inseparable from the defeat of progressive forces in Germany in the 1920s, a decade prior to the seizure of power by the Fascists. I suspect that one of the reasons why Benjamin was so affected by his political surroundings is that he was either unable or unwilling to arrange the conventional compromises that shelter middle-class individuals from the fate of a proletariat more directly exposed to the cruelties of the class system. Even Benjamin’s theoretical investigations are radically subjective, as if the boundaries between private and public, between individual experience and the social world, exist only in order to be transgressed. Standing behind the doorway curtain, the child [who is hiding] becomes himself something floating and white, a ghost. The dining table under which he is crouching turns him into a wooden idol in a temple whose four pillars are the carved legs.... Anyone who discovers him can petrify him as an idol under the table, weave him forever as a ghost into the curtain.... And so, at the seeker’s touch, with a loud cry he drives out the demon who has so transformed him – indeed without waiting for the moment of discovery, he grabs the hunter with a shout of self-deliverance. The hero’s adventures can still be read in the swirling letters like figures and messages in drifting snowflakes. [The child’s] breath is part of the air of the events narrated, and all the participants breathe it. He mingles with the characters far more closely than grown-ups. He is unspeakably touched by the deeds, by the words that are exchanged, and when he gets up, he is covered over and over by the snow of his reading. “Homeland’s sadness” refers here to Germany’s situation between the wars. But the words carry a more personal meaning also. “Homeland” names a private domain that already as a child one may come to know very well – a domain that melancholy seeks to leave behind but to which it inevitably returns. Separation from the Other gives rise to what psychoanalyst Melanie Klein called “the depressive position,” which appears to have entrapped Benjamin politically as well as personally. Like Klee’s Angel, Benjamin felt caught in history’s tangle – propelled forward, yet incapable of disengaging from the past. Keeping in mind the self-destructive endpoint of his journey, we might reach the conclusion that our task is to put the past behind us and to resist melancholy’s regressive attraction to dissolution and death. Indeed, because of the terrible ways in which death typically occurs in the world as presently constituted, we have learned to associate it with everything bad: cruelty, violence, and defeat. Benjamin’s work, however, looks forward to a time when this association can be suspended, and melancholy and death recognized as creative as well as destructive forces. In Albrecht Dürer’s 16th-century engraving Melancholia I, for instance, Benjamin perceives “The deadening of the emotions... an intense degree of sadness.” The instruments of mathematics and science are of no use to the disconsolate angel who stares at surroundings deprived of meaning. Yet, through the window of her study, the heavens illuminate a transcendent seascape. There resides in every object, Benjamin believes, an “enigmatic wisdom,” made accessible by the very sorrow that contemplates a disenchanted world. True, melancholy often leads to passivity and resignation. But its rejection of the status quo also harbors a utopian impulse that can motivate activism and change. Many of Benjamin’s contemporaries responded to their historical circumstances with courageous resistance and commitment to one another, along with their sorrow. In Benjamin’s case, melancholy issued from a selflessness that, in the absence of the “normal” defensive structures that shore up the ego, was acutely sensitive to everything going on around him. Hence his writing manifests a spontaneity and immediacy of perception that, in combination with his analytical skills, give rise to the “illuminations” that still dazzle readers today. The past carries with it a temporal index by which it is referred to redemption. There is a secret agreement between past generations and the present one. Our coming was expected on earth. Like every generation that preceded us, we have been endowed with a weak Messianic power, a power to which the past has a claim. That claim cannot be settled cheaply.... even the dead will not be safe from the enemy if he triumphs. And this enemy has not ceased triumphing. This insight notwithstanding, Benjamin did not ally himself with any social movement. Neither Zionism, the Communist Party, nor any of the fragmented socialist parties could capture his allegiance. Ironically, the political passivity and disabling melancholy to which Benjamin himself was vulnerable became the target of his sharpest criticism when he recognized these attitudes in others. Among those whom Benjamin criticized was Erich Kästner, author of Fabian (1931), a novel that was based on the suicide of my uncle, Ralph Zucker. The novel expresses the sense of despair and futility that seized Weimar’s “Lost Generation.” In this book, there is much that reminds me of contemporary America: the sense of a foreclosed future that rules out significant social change, the pervasive cynicism that, while recognizing the world’s cruelty and injustice, regards these conditions as inalterable. The worldwide economic depression that began in the late 20's was more devastating in Germany than it was here in the United States. Then as now, affluence coexisted more or less comfortably with homelessness. Weimar capitalism – like capitalism today – scarcely concealed the fact that it organized the world to benefit the wealthy. This arrangement was made acceptable to the public by giving them the opportunity to buy into a small part of the rulers’ abundance. (Benjamin notes that “The poor person, even if he possesses only one Thaler, can participate in the holding of public stock which is divided into very small portions, and can thus speak of our palaces, our factories, our treasures.”) Stock-ownership, though, offered little actual economic control, as a character in Kästner’s novel elaborates: “The manufacturers reduce wages; the state accelerates the decline in the purchasing power of the masses by imposing taxes which it dare not impose on the rich; capital still flees by the billions across the frontiers. Isn’t that consistency? Can you say that madness has no method?” The “masses,” previously the Marxist agency of hope and collective action, are represented here only as consumers, having fallen far from the ideals of self-determination that, a decade earlier, had motivated the workers and soldiers councils. Benjamin’s discussion of the novel focuses not on the inaccuracy of its description of the world but on its resignation. The sense of hopelessness in Kästner’s writing can lead, according to Benjamin, only to political stasis and defeat. Looking back on Benjamin’s life, we may perceive in his criticism of Kästner a reflection of his own internal battle to overcome despair. In the historical project of liberation, Benjamin represents the Angel of History as being on our side – the angel wants to intervene but does not have the power to do so. Do we? Benjamin criticizes the pessimism that regards fundamental change as impossible and that tells us that historically, utopian dreams have been losing propositions. As an antidote to resignation, Benjamin proposes “the gift of fanning the spark of hope [that was] in the past,” as if memory could ignite a kind of prairie fire across the generations. Such memory is identified by Benjamin as “the quintessence of Judaism’s theological concept of history.” Embedded within Jewish tradition is extraordinary hope – Biblical accounts of Exodus and of the Maccabees, for instance, remind us that liberation movements can succeed against seemingly invincible power structures. True, no community can restore what has been lost. In Argentina, for example, the Madres de la Plaza de Mayo movement was organized by women who realized that, except in very rare cases, their efforts would not return to them those who had been “disappeared.” By sharing their stories and working together, however, they did contribute to ending the military dictatorship. In associating with others to form a freer, more livable world, we may discover that health can be restored to the injured parts within ourselves. At the end of this century, Benjamin’s Angel of History is still waiting for us to create the relationships – across the generations, across boundaries of every kind – that will enable him at last to take wing.